Reconstruction is upon us again. Yesterday, I asked what we would do as a nation, once the election was over? The general sentiment was that Hillary would win. People seemed all to ready to wipe their hands clean of this nasty politics business, and then move on with their lives. This morning, we have entered a new Reconstruction Era in America. Much like we “woke up” after the Civil War, and after 9/11, many Americans are waking up with their assumptions destroyed. Perhaps it’s an opportunity to rebuild the fabric of this country. Many people are in mourning, some are gloating, and some are as indifferent today as they were before the election. The way we act towards each other will determine whether or not we continue devolving, or if we use this moment to stop the bleeding. The shock that people are expressing is reminiscent of the reaction to 9/11. People could not imagine that a country as great as ours could be on the receiving end of such hatred. Much earlier in our country’s history, people could not believe that some would be willing to commit civil war, in order to protect the economy and social privileges that were built on the back of slaves. Telltale signs existed long before the votes were counted. The media kept talking about the mythical “uneducated white male” voter. Meanwhile, plenty of educated men and women openly also throwing their support behind Trump. For those who are disappointed, consider what, specifically, you are disappointed about? What did you do for your country since the last presidential election? As a society, we also need reconstruction. I wrote several months ago that we cannot wait until there is a crisis to come together. We must regularly engage in discussion with our fellow citizens, and those who represent us. It doesn’t matter what stripe a politician is, they all work for us. It’s up to all of us to hold them accountable. In a true democracy, we must continue to work at making a more perfect union. Click To TweetThere is never such a thing as a done deal in America, unless it was already enshrined in the Constitution or the Amendments. Yes, it matters what politicians that we elevate to the presidency and the Congress. However, there are many more micro-decisions that must be made in countless municipalities across the country. 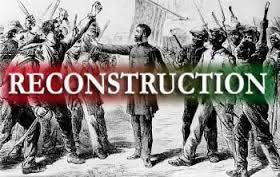 That is the foundation of the new reconstruction era we need in this country.